Freddie Baer is a political artist and graphic designer who lives in San Francisco. She is best known for her detailed, surrealistic collages; her illustrations have appeared on book covers, t-shirts, posters, and album covers. A book of her early collage work, “Ecstatic Incisions: The Collages of Freddie Baer,” was published by AK Press. 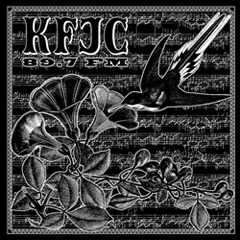 The KFJC Artist Series T-Shirt is available on a 100% cotton shirt as our thanks for your generous donation of $45 or more.